This article is about the 1973 film. For the informal title, see Jim Thorpe and Olympic decathlon champion. 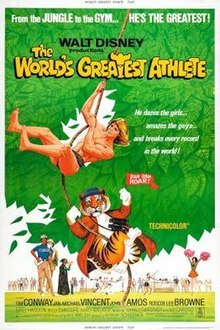 The World's Greatest Athlete is a 1973 American feature film released by Walt Disney Productions. It starred John Amos, Roscoe Lee Browne, Tim Conway, Dayle Haddon, and Jan-Michael Vincent. It is one of the few wide-release Hollywood sports films to look at the world of track and field, as the "World's Greatest Athlete", Nanu, played by Vincent, tries to make history by winning every event at the NCAA Track & Field Championship. Sam Archer and his assistant Milo Jackson are coaches at Merrivale College. They have lost every game in every sport which they have coached, raising the concerns of the head of the Alumni Association. With only one year left on his contract, Archer decides that he is in need of a vacation. Together, Archer and Jackson head to Zambia in Southern Africa. While out on a safari, the pair catch sight with their guide Morumba of the Tarzan-like Nanu, who can outrun a cheetah in full bound. Seeing this, the coaching staff quickly whip out their recruitment pen and papers, but soon fall (literally) into the clutches of Nanu's godfather, spiritual leader Gazenga. Because Nanu is an orphan and an innocent child of the bush, Gazenga believes that throwing Nanu into the world of competitive United States college athletics would interfere with his spiritual development. Despite Gazenga's concerns, the ambitious coaches persuade Nanu to join the Merrivale College program. From this point forward, the plot is driven by a combination of slapstick and suspense, for Nanu's destiny as the World's Greatest Athlete will annoy several powerful people who are used to getting their way. Nanu's innocence, Archer's scheming, Jackson's ineptitude, Gazenga's outraged wisdom, and the Machiavellian plotting of the villains all play roles in the action as the film heads toward the final track meet. The atmosphere of American competition does indeed threaten Nanu, but he is saved from disintegration by love interest Jane Douglas. Jane and Nanu's budding relationship angers rival Leopold Maxwell, whose attempts to sabotage the budding star build toward a crescendo as the ultimate competition approaches. The climactic track meet is peppered with commentary by ABC-TV sportscaster Howard Cosell, playing himself. The film ends with a framing device in which the hapless coaches are depicted trying to recruit a new athletic phenomenon, this time in China. The film also features many prolific athletes and sports journalists in small or cameo roles, including Howard Cosell, Frank Gifford, Jim McKay, Bud Palmer, Joe Kapp, and Bill Toomey. Much of the film was shot at University of the Pacific and San Joaquin Delta College in Stockton, California, and in the Newhall neighborhood of Santa Clarita, California. The live-action jungle scenes were shot at Caswell Memorial State Park, on the Stanislaus River outside of Ripon, California. Nanu's closest companion is a pet tiger named Harry, which he brings with him from Africa to California; however, tigers are not native to Africa. Nanu explains that the tiger emigrated from India to Africa as a cub. The film was one of the most popular releases of 1973, earning $10,600,000 in North American rentals that year. Upon the film's release, The New York Times wrote: "it's a dream that is more often simple-minded than simple and generally as hilarious as finishing fourth in the mile run. It should be stressed, however, that this ribbing of the Tarzan myth runs a good, clean course that should grab all red-blooded sports fans up to and including the 14-year-old group. It might be added that everyone from coach Amos to Jan-Michael Vincent, in the title role, athletically tries without much success to make all this good-natured nonsense funny". The World's Greatest Athlete was released on VHS on March 18, 1997. The film was also released on DVD on August 2, 2005. ^ "The World's Greatest Athlete, Box Office Information". The Numbers. Retrieved May 27, 2012. ^ "Big Rental Films of 1973". Variety. 9 January 1974. p. 19. ^ Weiler, A. H. (February 5, 1973). "Screen: 'Greatest Athlete': Disney College Farce Is at the Music Hall". The New York Times. ^ The World's Greatest Athlete'. Walt Disney Productions (DVD). Burbank, California: Walt Disney Studios Home Entertainment. August 5, 2005. ASIN B0007Z9QZ8. Retrieved March 12, 2019. This page was last edited on 13 March 2019, at 00:14 (UTC).